Best WordPress Corporate Business Themes of 2017 For Startups and Medium Sized Companies - GeekCast en Español..
Divi is a completely innovative and infinitely creative WordPress theme, a multifaceted and readily adaptable website building solution packed to the brim with useful and convenient, wonderfully time-saving and unimaginably deeply configurable widgets, shortcodes, elements and features, elegantly offered through a visual interface based on the exclusive block-based Divi Builder and a drag and a drop mechanic that will take seconds to master and reduce the time it takes to develop a handsome and professional quality website down to minutes. Dozens of readily available, professionally designed page templates and layouts as well as independently certified security features make Divi a solid choice for business and commerce websites that need power and flexibility. It also includes the ability to hit the ground running from day one, all of which Divi efficiently brings to the table. Extensive SEO capabilities, serious and sleek Portfolio pages for showcasing your works and much more under the hood also make Divi the most reliable theme for creating successful business websites today. If your goal is to design a successful business website, look no further than Uncode. This versatile business WordPress theme can adapt to any market niche, and provide users with an accessible and intuitive interface. It maximizes your page’s performance, proving to your customers that your company values quality and attention to detail. When it comes to aesthetic customization, the Visual Composer tool has you covered. This feature simplifies and streamlines the process, while providing you with many personalization options. Uncode is a product that can accommodate any user, not just those with advanced programming knowledge. With Uncode, you may use your business page in order to distribute your products. It also includes a WooCommerce plugin, which is one of the most prolific plugins on WordPress. It facilitates the creation of professional online stores, providing users with an opportunity to increase their revenue stream. You can even cater to an international audience, given the inclusion of the WPML plugin. Creating multilingual business sites has never been easier. This automatic scaling further increases your site’s adaptability, resulting in an excellent browsing experience for all potential customers. Jevelin has for you an incredibly robust set of tools, plugins, template and full-fledged demo websites that make most website design and construction tasks an easy, breezy matter; it requires absolutely no coding knowledge and just a few clicks in order to achieve professional levels of polished graphical customizing. This theme is also built with a powerful framework for the intuitive visual design of layouts and pages, while incorporating a broad range of advanced admin panel tools for you to thoroughly fine-tune your website’s behavior and overall look in a matter of minutes. Jevelin can effortlessly handle all sorts of usage cases and industry-specific necessities with its well over 40 custom elements, complete with customizable settings and much more under the hood. This theme is perfect for businesses of all kinds; with its six different portfolio layouts and plethora of portfolio custom settings on top of out of the box functional WooCommerce-powered online shop features that allow you to market your wares to the world at large easily and quickly. With Jevelin on your side, your business will reach new heights! A dedicated team of professionals and developers have crafted Massive Dynamic with the utmost care and attention to detail, working jointly to ensure the smoothest, most well-polished and profoundly functional interfaces, elements and technology make it up. This theme also includes over 70 completely unique shortcodes, as well as a myriad different headers, footers, navigation bars and templates, arranged enticingly across multiple convenient demo websites and pages which users can import with a single click. The unique Live Website Builder makes customization and thorough branding a simple, uncomplicated matter requiring absolutely no coding experience, with pristine, polished results every time. Massive Dynamic is ideal for businesses and corporations across a huge range of industries and fields. Its modern, attractive ambiance and beautiful, engaging end-user experience make Massive Dynamic a solid choice for webmasters seasoned and rookies alike. Massive Dynamic’s Bootstrap framework makes it natively responsive and cross compatible with devices, browsers and platforms the world over. Try Massive Dynamic today! Bostan is an exceedingly thought-out theme that has been masterfully crafted with painstaking attention to detail. Its goal is to deliver a consistently outstanding product that enables webmasters of any background and skill level to easily and quickly put together sophisticated, functional and enticing business websites of any nature, from corporations to online entrepreneurs, from creative agencies to professional firms. If you are looking to conduct some real business and want to put it online, Bostan is the theme to suit your needs. Decked out with handsome features like Projects Carousel, Clients Carousel, Team Members Carousel and Testimonials Carousel, Bostan will have your users fascinated and engaged every step of the way. And with cutting-edge Bootstrap technologies powering all of Bostan, development is simple and accessible, with thorough annotation and extensive documentation included. Bostan is easily customizable to suit your every need, and packs premium plugins like the Revolution Slider and Isotope Portfolio Filter at no additional cost to you. Go Bostan today, and you will never look back! TheGem is a wonderful set of powerhouse tools, widgets and plugins carefully selected to work in conjunction, providing you with a robust, resourceful modern website across any number of possible fields, industries and businesses, as well as any kind of personal or professional usage cases. Based on a modular Bootstrap design, TheGem is as mobile friendly a theme as they come. And with over 40 unique conceptual demo websites for you to choose from, you will always find the right way to present your website to the world within TheGem. Additionally, over 150 template pages ensure that you can always expand your website to add just the right feature. Meanwhile, the premium Visual Composer drag and drop page editor plugin lets you commandeer the look and feel of your website without having to write a single line of code yourself. TheGem is perfect for small and large business ventures, for professional portfolios, for personal or corporate blog websites, and even for online stores. In additiin, with its WPML compatibility, reaching your audience across the globe is as easy as pie. Try TheGem today! Etalon is a powerful WordPress theme for entrepreneurs and services companies. It is a well-documented instrument to reach the technology era with what you can offer. Selling transactions and shops or product display are handled with the well-praised WooCommerce. Etalon also features great plugins like Contact Form 7, Google Maps or Typekit. It has a vast collection of icons and fonts that reaches more than 3000. Everything about it is customizable and fast loading. Furthermore, it is an awesome Bootstrap-based creation with Drag & Drop built. Etalon also has incredible options for galleries and portfolio showcasing. It lets you basically play with 2 premium sliders and a photo specialized plugin. Use Slider Revolution, Lightbox, Google Fonts and more. Etalon has a HTML5 and CSS3 built with SEO in mind. Animations and searching bars are just amazing! Layout and panel actions in general are completely customizable. Etalon is also easily adaptable to all screens and browsers. What’s more, all pages are multilingual ready with WPML. Custom elements include countdowns, pricing tables, calendars, team members and more. Still not convinced? Doubts about functions or performance can be solved with their support team. Updates are permanent and free! Get this 5-star reviewed theme right now! Get Etalon! One of Specular’s most impressive features is that it lets you sample the content by trying the demos. In addition, you may interact with the demo and personalize it, without spending a single dime. Currently, there are over 28 of these templates available. If you ever encounter something that seems unfamiliar, be sure to consult the theme documentation. It is well-written, informative, and obtainable for free. Should problems arise, the Support Forum is ready to receive your question. Regardless of what issue you are experiencing, do not hesitate to go to the forum. The support representatives are eager to help all customers. If you do not have the time to read the Documentation, there are video tutorials and presentations on the theme’s website. If someone attempts to resize your page, its visual quality will not deteriorate. It does not matter if you are using a mobile phone, tablet, or laptop; the image will still look sharp. This theme’s fluidity is very impressive, as it boasts a large roster of features, preparing it for every conceivable business niche. Be it a private medical practice, photography, construction, or restaurant website, Specular is on your side. This product is very user-friendly. The Theme Options do not require any coding knowledge; you only need to click and select whatever options fit your vision. Specular incorporates a full-width creative blog style as well. Advice is a premium consulting & business WordPress theme. It has been designed with the expectation of profiting from inbound marketing. It uses the well-known Visual Composer and its features are GTmetrix-improved. Advice seeks to make users know about them through lots of good search filters from SEO. It also has useful connections to most popular social media platforms. You will even find contact forms and MailChimp newsletter integration; making contact with potential customers is important! Advice also has a highly malleable and responsive layout. It features a page scroll progress bar, side navigation and multiple pre-built elements. Set headers from 4 given options; play with +700 Google Fonts or Material Design Icons. Videos are completely customizable with Parallax effect! Advice also offers awesome Revolution Slider plugin to set gorgeous galleries! It is totally set up for online purchases with WooCommerce integration. You’ll get to make shops for yourself with ease. Make directories and lists from all your services and staff. Google Maps location services and full page translation with WPML are also available! Come try it with just a one-click installment process! In addition, it is well documented, translatable and provides regular updates. Try Advice! There comes a moment when every entrepreneur realizes that the business world does not forgive mediocrity. Your website will be your calling card, and you cannot afford to present a sub-standard design. Studio 8 is a theme that allows everyone to construct an impressive business page, regardless of their skill level. For non-technical users, developers will handle the installation and configuration. This product includes many useful features, and a design that never fails to impress. All settings will be under your control, and you can expect a decent number of free updates. There is even a Refund-Policy, with a 30-day money back guarantee. Studio 8 works with any version of WordPress and is compatible with any device, web browser, or operating system. This not only expands your target demographic, but it also allows you to update content while on the move. Working from your smartphone has never been easier! The site incorporates 3 custom widgets, several widget areas, and a threaded comment feature. Users can also benefit from a powerful Drop-Down menu, multiple HTML files, and a 404 error page. The theme code is clean and streamlined, and the fast-loading pages will never waste your time. It is not often that such a theme emerges on WordPress. X is a pioneer and a record breaker, as it is the most popular WordPress product that offers multiple designs and concepts. Included in one bundle, users can enjoy 4 unique designs called stacks. X also offers a large package of features, greatly increasing its versatility and value. It does not matter which web browser your users prefer, as this theme will work on all of them. Some extensive documentation also comes with the package, which offers a vast amount of information to anyone that is willing to read it. If any issues emerge, the support staff is eagerly awaiting your request. Themeco has a dozen dedicated and hard-working representatives that are available full-time. These driven individuals aim to further develop and support the product. With X, the customer is getting a bang for his buck. A large amount of plugins are available free of charge, included in the standard download. These are not regular plugins that were offered for the sake of bloating the theme’s feature list, but custom made extensions that were specifically designed to operate with X. If Envato is to be believed, X has broken all WordPress sales records. It won the title of fastest selling theme. It is so good, that the state government of Utah has commissioned its own copies, with more orders to come in the future. X has irrevocably changed the WordPress landscape, raising the bar for all future products. Kalium is an excellent WordPress theme best for blogging and portfolio websites. It has plenty of layout design variations, along with an impressive drag and drop content builder. In just its first month, Kalium was downloaded over 600 times, making it the new fastest selling WordPress theme on the market. It has received several prestigious awards, including the CSS Design Award in April. This theme is set to include its own online shop, which will be added with future updates. Users will be able to commercialize their services and items, taking advantage of a stable and reliable platform. Currently, customers can benefit from a $10 price discount. In addition, those who purchase Kalium now, will benefit from a series of free updates. Given the staggering amount of useful features, the price is very reasonable. The impressive Visual Composer was added, which is a premium plugin normally at $28. This allows users to easily construct their pages in a matter of minutes. With Kalium, your future website will benefit from multilingual support. This is due to the inclusion of the versatile WPML plugin, along with .po and .mo files. A translatable page is more likely to attract visitors, making your content more accessible. Every single element has its own specific short code, as customers can implement it on any page. For more information regarding this topic, be sure to consult the extensive theme documentation. Kalium offers a live preview, along with some interesting screenshots. The Revolution slider is also available, offering a multi-purpose Slider Display system. You can now showcase your content in an efficient manner, proving to your potential clients that you are worthy of their consideration. Incubator is the result of a dedicated design and developed process over a length of time, seeking to create a perfect platform for the fast and flexible crafting of unique, noteworthy websites capable of performing at professional level under all usage cases and traffic conditions without requiring you to write a single line of code yourself at any point. That’s why many businesses love Incubator; it equips you with the ability to accomplish palpable, high-quality results within minutes, regardless of your background. The amazing Visual Composer drag and drop page builder, combined with the equally impressive Revolution Slider slideshow builder, allow you to create truly enthralling visual experiences for your users. Meanwhile, a set of fully out of the box functional, in-house developed commercial capabilities make Incubator a competent means of distributing your products and services. Compatible with the industry standard WooCommerce plugin suite as well as prepared to handle digital products and downloads, Incubator is everything a modern business needs to make it big on the internet. Try Incubator now! Simple & Elegant is the result of a careful and deliberate approach to website design, with a streamlined, polished finish that permeates every iteration of this powerful and graceful theme. This theme has extensive technological capabilities, with wonderful widgets like the Slider Revolution, MailChimp and Instagram widgets with custom stylings and working out of the box, the Visual Composer tool, MegaMenus, and a wealth of in-house developed Live Customizer options to thoroughly adapt your Simple & Elegant website to suit your graphical and branding needs in no time at all and requiring absolutely no coding. Simple & Elegant is an excellent theme for handling one page websites, as its streamlined trim and navigational experience translate deftly into one page designs, plenty of which are included with Simple & Elegant out of the box and readily available. It is also extremely intuitive for webmasters, so that users of any background can produce professional looking one page websites of any nature or kind with ease and speed. In addition, thorough documentation comes with the package, so you truly get the most out of this theme. You is a modern and trendy, useful and resourceful, tech-savvy and easy to use, readily responsive WordPress multipurpose website theme. A team of professionals have cleverly conceived this theme in order to procure a swift and effective framework for webmasters, new and seasoned alike, to easily put together sophisticated modern websites in the blink of an eye. It currently counts with 10 professionally designed demo websites for a range of niche applications, but the list is constantly expanding. Furthermore, the premium Visual Composer drag and drop page builder and the elegant Revolution Slider premium plugin are both provided for you to effortlessly style any demo or template page to suite your visual, graphical or branding needs in an intuitive, speedy fashion. Potent commercial and business relevant features are packaged within You, allowing for all sorts of possibilities, from beautiful and functional online shop websites powered by the industry standard WooCommerce e-Commerce plugin suite to the flexible bbPress dedicated social forum plugin to effectively gather hundreds or thousands of users into dedicated forums on your very own website. Business users love You’s Pricing Tables and charming Typewriter effects and Counter features. It’s time for you to try You, and let it impress YOU! Infinite is a technologically advanced and incredibly flexible, smooth and fluid, dynamic and rapidly responsive WordPress multipurpose website theme. This theme has been devised as a true multipurpose, a veritable shape-shifter of a theme that can take on an endless range of usage cases and website applications and execute them to perfection within its robust, adaptable framework. Packaged with dozens of purposeful and time-saving demo websites and template pages, Infinite is a highly efficient approach to site design, and with the GoodLayers drag and drop page builder, layout customization is both easy and hassle-free, with results displayed live before your eyes. Infinite is ready to go from day one, with single click demo import tools that allow your website to be up and running the same day you set up, awaiting nothing but your precious content. One-page capabilities are plentiful with Infinite, including delightfully smooth Parallax visual scrolling effects and infinite loading technologies for seamless one-page presentation of any demo website or page template within Infinite. With cutting edge handling of multimedia content, Infinite looks good and feels young and innovative, and engaging video wrappers liven up your website like none other on the market today. Try Infinite now! If you are having trouble with the installation process, be sure to consult the free video tutorials. They can explain everything in detail, helping you to master your site. For those who prefer reading, a detailed theme documentation source is available. Circle Flip also offers an impressive design for any hosting website. It embodies a straightforward and efficient business mentality. Your one page site will feature a wonderful menu, and a nifty scroll effect. Total is a robust and reliable, competent and professional, easy to use and highly responsive WordPress multipurpose website theme. It is the result of an elaborate and careful design and development process by a dedicated team of professionals working to provide webmasters with an easy and intuitive platform for putting together sophisticated, functional websites in the blink of an eye. Total is perfect for all sorts of applications and website archetypes; from professional and personal projects to business and corporate endeavors, Total can tackle them all. Total is loved by business webmasters across the board because its masterfully crafted live demo websites and resourceful page templates are chock-full of business-friendly features for product portfolio presentation, pricing plan presentation or staff introduction pages readymade, nothing but a few clicks away. Furthermore, a powerful Theme Customizer allows Total to completely shift its appearance and behavior through a completely intuitive visual interface, while the WooCommerce eCommerce plugin suite makes Total a perfect platform for marketing your products and wares to the world at large. Try Total now! Financity is a WordPress theme designed for business & financial activities. It perfectly suits accounting sites, financial companies and law firm websites. You will get a flexible, customizable and resourceful theme ready to use. Financity comes with several pre-built layouts for blog, gallery and portfolio sections. You will get to put and/or disable footer/copyright section in specific pages, too. Financity also comes with Revolution Slider and Light Box integration! Choose between iLightbox and Strip to use it as an overlay window. Galleries and portfolios are easy to set, especially with its live customizer. Make instant and amazing changes! Financity also uses the well-known Good Layers page builder for all its perks. It lets you add Google Fonts and unlimited sidebars, too. This work of art comes with SEO optimization and a great customizable admin panel. Fast performance and intuitive options will be at your reach. Moreover, Financity is AMP ready and can be updated with a single click. It supports WPML translation and WooCommerce to set online shops. It also comes with well detailed documentation, outstanding customer support and easy installation. Intact is a well rated award winning Elite Author product. It comes with multiple specialized demos and homepages. You get a child theme and smooth modern looking, clean theme. Intact Business, one of the pre-built demos, is packed with everything needed. It has a simplified panel of no coding requirement and a responsive layout. The design also comes with customizable footers and headers. 600+ Google Fonts and many columns for posting are also featured. Intact also comes with a Redux framework and Visual Composer as its main page builder. Use compatible plug-ins like Revolution Slider for galleries and WPML for translations. As a must for business transactions, you get WooCommerce compatibility. Other features like CSS3 animations, SEO and Parallax are also at dispose. Intact gets constant updates for free with bug fixes, improvements and tutorials. This great tool is Google Maps integrated and open to social networks share buttons. It is also Contact Form 7 and Bootstrap compatible. Moreover, Intact is versatile and keen for out of the box online businesses. It makes you stand out wherever you are with a one-click install! Try now this awesome widget ready, pixel perfect, handy and dynamic theme! Acquire Intact Business now! Brando is a one-page multipurpose WordPress theme that has lots of versatility and specialized demos. It also comes with many interchangeable layouts and a child theme. Brando can be adapted to any kind of business you want. It fits well for publicity where constant news feeds leading to different links is the key. You will get pre-built choices for layout styles for portfolios, blogs, and galleries. Brando has amazing colors and typography emphasis. It uses Google Fonts, Fonts Awesome and Et-line. Backgrounds can even be customized with Parallax and animations or videos. You can also set up social sharing buttons and play with their location. Brando also uses the well-known Visual Composer page builder. It has lots of documentation that make everything fast to grasp. It even uses lots advanced panel simplifications and shortcodes to speed the process. Brando is Contact Form 7 and WPML compatible. It is an award winner in its field with more than 10 nominations and won prizes. Flexibility is simply the main element for this theme. You can build and promote any business and use the available child theme to set up shops! Get a good look at this awesome theme and start using it. Go for Brando! You will also get a live customer support and a live customizer. That way, you can make changes and solve doubts both on real time. Fi-Print comes with lots of shortcodes to make panel access and options the best ever. You also get the possibility to use Layer Slider for your image posting and photo galleries. Searches and page response are fastened with SEO and a speed enhancing plug-in. Fi-Print is thought out for a quick set-up with lots of versatility. You will also get headers and footers to modify at will. In them, you can add social media share buttons too. Enjoy this high quality mobile friendly product…Use Fi-Print! 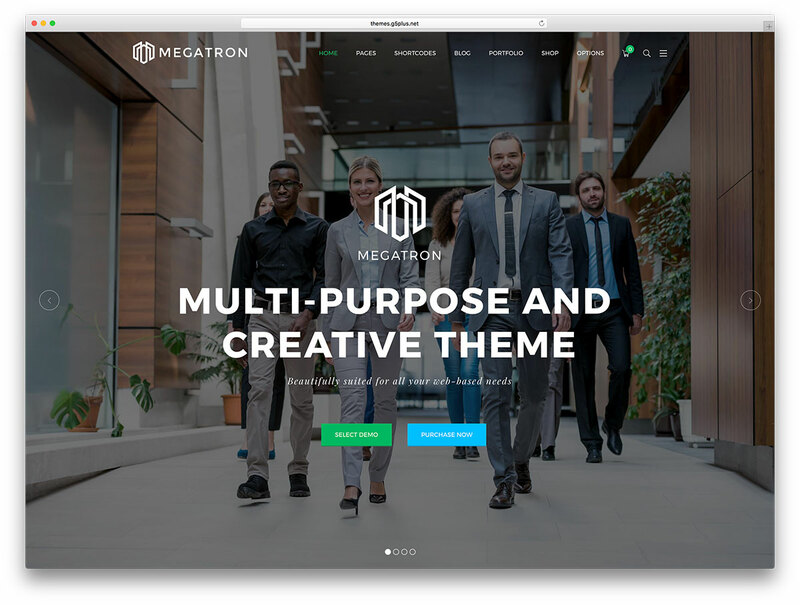 Megatron is a multi-purpose WordPress theme that has more than 25 demos and homepages and child theme. Among them, you will find one dedicated to business only. Megatron has a WooCommerce trading plug-in and a very well-trained customer support team. It uses the whole Drag & Drop package with Visual Composer, Slider Revolution and Photoshop files. Thanks to its 1000 included icons and unlimited Google Fonts, you get a fully creative experience all together. Megatron is a premium quality product that gets automatic updates from Envato. With its layout design, you will find numerous headers and footers. You will also get a MegaMenu and more than 4 columns to post. Megatron uses Parallax for its background, and has countless colors customization for its layouts. For translation matters you have RTL and WPML compatibility. Megatron is the quickest most solid way to get your business up to rise with simple and smooth options. It is compatible with the latest Bootstrap and all browsers in the market. Get the best experience for your business with Megatron Business! Folie is a new incredibly versatile WordPress theme that has a special codeless page builder. You will get it with live customizations and many predefined elements. Even several demos and a child theme are included! Folie also has a particular emphasis on portfolio and abilities showcase perfect for professionals. It features LightBox and 2 premium sliders to set astonishing galleries. Work with more than 6 amazing sets of fonts and +100 icons. Google Fonts, Font Awesome, also come with the package. Folie allows all changes to be easily crafted within seconds with a live customizer. It also has third party plugins compatibility and uses Codeless Builder as page builder with draggable elements and spaces. Folie lets you set a practical design with a flexible MegaMenu and tons of posting formats in up to 6 columns. Make options display practical with a widgetized footer and a header navigation bar. Folie even features unlimited blog layout styles and many portfolio details. Layout in general is responsive with cross browser compatibility and screen adaptable image. In addition, Folie features header builder, portfolio, staff, testimonial inline editing. It has boosted performance: loads only needed scripts and files, GPU accelerated animations and parallax. Don’t miss out from customizing backgrounds with videos and animations! Use this well documented with video tutorials theme now! Provide is a professional multipurpose WordPress theme focused on consulting and finance in all levels of businesses and agencies. You will get it with 12 homepages and demos. Provide easily adapts to any expectation and provide a white canvas to customize. It is fast and responsive, with a sober serious tone. It also has an incredible live customizer to play with the entire layout! Provide uses 5 pre-built styles for blogs and portfolios. You will get to customize color settings and backgrounds in unlimited ways. Parallax effect and a header/footer builder also come with the package. Even a great set of Google Fonts are available! Provide uses add-ons like charts and pricing tables for economical projections. It also uses Visual Composer and Revolution slider for main page build. Provide is minimalistic, clean and aesthetic. It also has a focused professional vision and gives a relevance to visual aid. Thus, previous customers and buyers have rated with 5 stars. Provide is simple to use and understand, yet it features documentation and support. It also has connections with social media through icons and Google maps integration. Get this appealing, modern and flexible theme adapted to your business. Get Provide! If you are looking for a clean, modern and professional WordPress business theme, then Zerif PRO is the right choice. This theme comes with awesome parallax scrolling for various sections of your website as well as smooth CSS3 animations that makes your content to appear with style. Zerif PRO theme is also SEO friendly and that should help with traffic from search engines. The theme comes with several custom widgets, page layouts and everything else to create website for any kind of business.